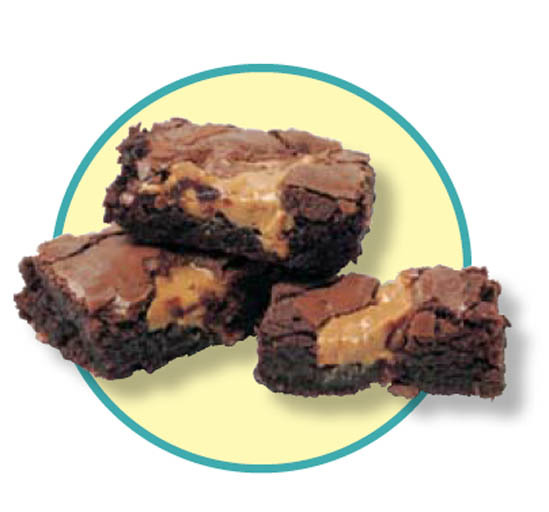 Stir up some brownies that everyone will love using a box brownie mix and creamy peanut butter. 1. Preheat the oven to the temperature indicated on the brownie mix box. Mix the brownie mix as directed on the box. Pour the mixture into the baking pan. 2. Using a spoon, drop the peanut butter by teaspoonfuls on six different spots on top of the brownie batter. 3. Use the knife to make lines through the batter, slightly mixing in the peanut butter. Don’t mix it too much. 4. Bake as directed on the brownie mix box. Let brownies cool for about 5 minutes before cutting. Makes 12 small brownies.